There is a metro line from Madrid city to the airport terminal T4: Metro Mine 8 Nuevos Ministerios - Aeropuerto T4. The line has two metro station at the airport. From 6.05 a.m. (morning) to 1.30 a.m. (night). The route to the airport since the beginning of the line 8 takes 13/15 minuts to the T1-T2-T3 metro station (first stop at the airport), and takes 5 minutes more until the second metro station at the airport (the last stop), at the terminal T4. 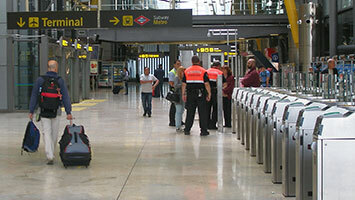 Between metro stations "Aeropuerto T1 T2 T3" and "Aeropuerto T4" there is a metro station called "Barajas". This metro station is in the town, not in the airport. Atocha-Renfe train station to Tribunal, via metro line 1. Change trains in Tribunal to take the metro line 10 in direction to Nuevos Ministerios. Change trains in Nuevos Ministerios to take the metro line 8 in direction to the airport. the second one is "Aeropuerto T4", situated at terminal T4 floor -1. From Chamartín to Nuevos Ministerios via metro line 10. Taking the metro, you can get to the airport with the Metro line 8: Nuevos Ministerios - Aeropuerto T4. Tiket permits entry and exit on journeys made between any Metro Zone A and ML1 station (Minimum price of €4.50 up to 5 stations; €0.10 per additional station, up to a maximum of €5 for journeys of more than 9 stations) and Airport T1-T2-T3 and Airport T4 stations until the new per-section fare is implemented. Tiket enables entry and exit on journeys between any of the Metro Zona A, MetroSur, MetroNorte, MetroEste and TFM stations, and the Airport T1-T2-T3 and Airport T-4 stations. Passengers holding a ticket valid for Metro zone A (Metro zone A single, Metrobús 10-trip passes and combined single tickets) must pay this supplement to get on or off at the Airport T1-T2-T3 or Airport T4 stations. Users with transport passes or tourist passes do not pay the Supplement to the airport. Metro line 8 teriffs . Metro line 8 schedule .